Tanzania in many ways represents Africa today. Lying just south of the equator in East Africa, you find a modern country, busy nation building. Once you leave the city you will find pre-historic sites, ancient towns and mosques together with wildlife on an incomparable scale. From the Serengeti, where the last of the world’s mammoth herds of plains game roam in their hundreds, to the green foothills of snow-mantled Mt. Kilimanjaro to the beautiful island of Zanzibar - Tanzania allows everyone a vivid African Experience. Day 1 — Depart Arusha for Lake Manyara National Park. 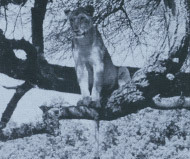 This afternoon safari in search of Lake Manyara’s famous tree-climbing lions. The fantastic profusion of both animal and bird life is due to the variety of landscape, the ground water forest, acacia woodland, areas of open grassland and the lake itself. Day 2 — Safari across the grassy plains and acacia woodlands, via the Olduvai Gorge, where the well-known Leakey family uncovered the fossil hominids, Zinjanthorpus bosei and Homo habilis which transformed our knowledge about human evolution. Visit the museum and the various sites of the Gorge. Continue to the Serengeti and an afternoon game drive. Day 3 — Game viewing and an opportunity to view the vast herds of plains game, more than two million wildebeest, zebra and gazelle. The famous ‘migration’ occurs from mid-November to the end of May and the plains are literally teeming with animals. Day 4 — Early morning game viewing before departing for the Ngorongoro Crater. If time permits you will enter the Crater for some game viewing. the grassy plain, lake and marshes on the 102 square mile crater floor, 2000 feet below. You will safari the entire day, by Landrover, on the crater floor. Day 6 — Return to Arusha and your next adventure. NOTE: An additional day at Lake Manyara is included in some of the group departures. Return to Arusha would be on Day 7. The above itinerary may substitute Tarangire National Park for the Serengeti National Park from July to October due to the animal migration. The above itinerary may end in the Serengeti National Park allowing for an option to fly back to Arusha and avoid the difficult roads. Participation camping safaris are also available in Tanzania. For the person who prefers the sound of animal cries filling the darkness as you sleep beneath the stars or those who love the wilderness and enjoy the unpredictable nature of living out in the bush, camping safaris are just what you need! Helping out with setting up the camp and the camp chores all add to the fun. (3 Days) Lake Manyara, Ngorongoro Crater and Tarangire. by many to be Africa as it once was. Day 1 — Arrive in Dar es Salaam where you will be met and transferred to your hotel. Day 2 — This morning drive or fly south to Kibiti to the Selous Reserve. The Selous kingdom of elephants, crocodiles, buffalo and hippo. Camp overnight near the Rufiji River. The camp is in a scenic location on the Rufiji River; a privileged spot during sunrise and sunset. Day 3 — After breakfast a 3-4 hour hike. The day is completely set aside for the exploration of the Selous Reserve by foot. Accompanied by expert rangers with great knowledge of the reserve, you will be able to fully appreciate the natural environment in which you have immersed yourself. Stop for lunch and continue hiking in the mid afternoon to a fly camp which will be ready to set up. Fly camps will be simple but comfortable. Day 4 — Continue hiking further up the Rufiji River. There will be plenty of time to take photographs and to stop at places of interest. Day 5 — After breakfast return down river by boat stopping for a short hike and lunch. Continue along the river by boat until you reach the main camp. Day 6 — Have a leisurely breakfast followed by a game drive. Another game drive in the late afternoon with emphasis on what has not already been seen. Day 7 — This morning depart for Dar es Salaam. Best time to visit the Selous is mid-June to mid-October, and mid-December to mid-March. TANZANIA WILL COMBINE WELL WITH KENYA, GORILLA TREKKING OR ONE OF THE ISLAND PARADISES. ACCOMMODATION - There are many different styles of accommodation in Tanzania. Below is a small sample of those available. ‘Serengeti to Kilimanjaro’ Safari uses a combination of camps and lodges, however all lodges can be used if desired.